UK, 1992, 105 minutes, Colour. John Thaw, Kevin Whately, Jim Broadbent, Sean Bean, Diana Quick. 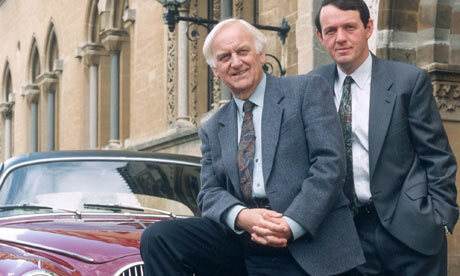 Absolute Conviction is an effective contribution to the Inspector Morse series. However, it presents a more dour Morse than usual. He is preoccupied, aggressive towards people, makes wrong decisions. However, an appeal is made to his more genial nature from the past. The film focuses on three prisoners, high-flying entrepreneurs of the '80s who have swindled their clients. However, with their deaths, a murder mystery arises. With some complexities, the film comes to a satisfying conclusion. The strength is in the cast, as usual, with John Thaw and Kevin Whately effective in their central roles. The supporting cast includes Sean Bean as one of the entrepreneurs, Jim Broadbent as a man accused of murdering his wife, and Diana Quick as the governor of a prison which is experimenting with more positive approaches to prisoners. Others in the cast include Susanna Hamilton. Direction is by Antonia Bird (Priest, Face, Ravenous). The Oxford settings are effective, the intricacies of character and interaction well worked out. 1. The popularity of the Inspector Morse series? Morse as a character, investigations? Sergeant Lewis? The Oxford environment? Social themes of the '80s and '90s? 2. The Oxford settings, prisons, homes, offices? Authentic atmosphere? Musical score and classical music - Morse's choir practice, love of the classics? 3. The title and its irony, Morse's absolute convictions, convictions of prisoners in jail? 4. Morse and his work, background? Isolated, dour, gruff in manner? With superiors? With Lewis? His antagonism towards Cheetham and his inexperience, use of illegal means, greed? The investigation, thoughts, clues? Interrogations? The antagonism towards Mrs Stevens and her prison, lack of courtesy? With the prisoners, with Charlie Bennett - and pursuing him in the streets of Oxford? His final working out of the clues? The satisfactory conclusion? Portrait of a detective? 5. Sergeant Lewis, devotion to his work, working with Morse, putting up with him? Investigations, interrogations, office work? Reports from laboratories, autopsies? The clashes with Cheetham? Helping Morse with the investigation - and his final ironic playing the joke on Cheetham? 6. The prologue and the introduction to Kryer, Thornton, Bailey? Bailey locked in his room, Thornton and his religiosity, Kryer and his death? The three men and their swindle? Their families? Kryer and his death, his young wife? Thornton and his religion, antagonism towards his son, his final confessions - and the code numbers for the money? Bailey and his wife, his writing, sports and training, poisoning, threatening letters? The injustice, their victims - and Lewis and Morse interviewing the victims and their antagonism? Their just deserts? 7. Mrs Stevens, the prison, her modern ideas? Treatment of prisoners, rooms, rehabilitation, freedoms? Her accountability? Antagonism towards Morse, working with him, information, hearing him inquire, her change of heart? Not wanting her job to be taken from her - and the lessening of the effectiveness of her work? Assistance in the prison, Laura and her support? Harris and his using the office typewriter for the threatening letters? The dismissal of George Newcombe? The drug background and Mrs Stevens' success in her work? 8. The prison doctor, his mistakes? The doctor and the autopsy? The prison doctor and his sport with Bailey? 9. Mrs Kryer, widow, money? Her liaison with Peter Thornton? Morse's interrogation and ignoring her? His antagonism and her reaction? The truth about the conspiracy? The contrast with Mrs Bailey, her story, love for her husband, agoraphobia, coming to his hospital bedside? 10. Sherman, background, money deals, working for Bailey? Crosswords? Exercise, the interview with Morse? The irony that he had murdered Charlie Bennetts' wife? Bennetts' revenge? 11. Charlie Bennett, his admiration for Morse, the 16 years, his freedoms, the chase through Oxford? His sense of injustice, not wanting to leave prison? The truth, his accidental killing of Kryer, the poisoning of Bailey? His hostility towards Bailey laughing at him? The murder of Sherman? His return to prison? 12. The range of characters, suspects, motivation? The reality of murder? The difference between different crimes and that of murder?